He’d promised to build the wall. To make America great again. To lock her up. 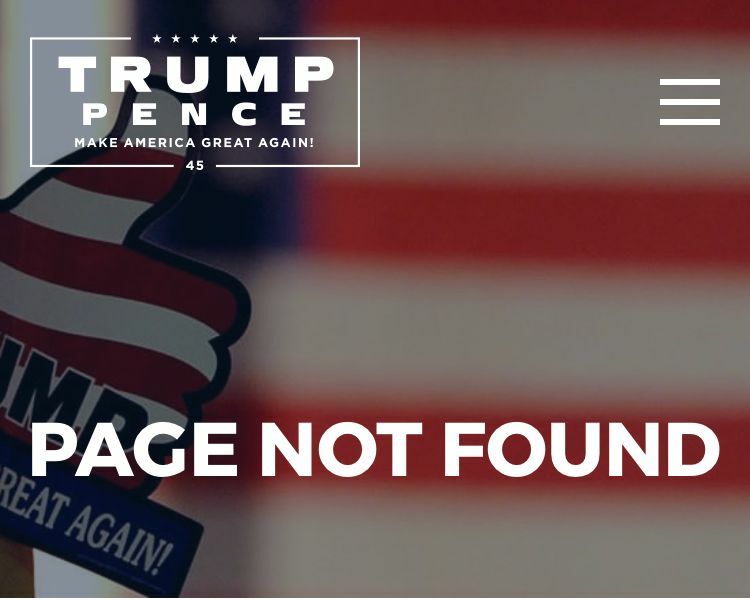 Now, in the last weeks of his campaign for president, Donald J. Trump needed one more stirring slogan. And since he was badly trailing Democratic candidate Hillary Clinton, it would have to be a marketing marvel worthy of Mad Men’s Don Draper, one that encapsulated the vague yet compelling promise of his candidacy—its worship of American ideals and its total break from them. “Drain the swamp” fit perfectly with Trump’s constant complaints about the “rigged system,” thereby excusing what some said was going to be a historic defeat. As the campaign concluded, Trump turned himself into a martyr for the cause of American democracy, waging a principled but doomed campaign. But a funny thing happened on the way to a third Obama term. Winning endowed the things Trump said during the campaign with an import they’d previously lacked. He was, back then, a hopeless renegade, troubling but not threatening. Then, the returns from Florida and Wisconsin came in on the evening of November 8. 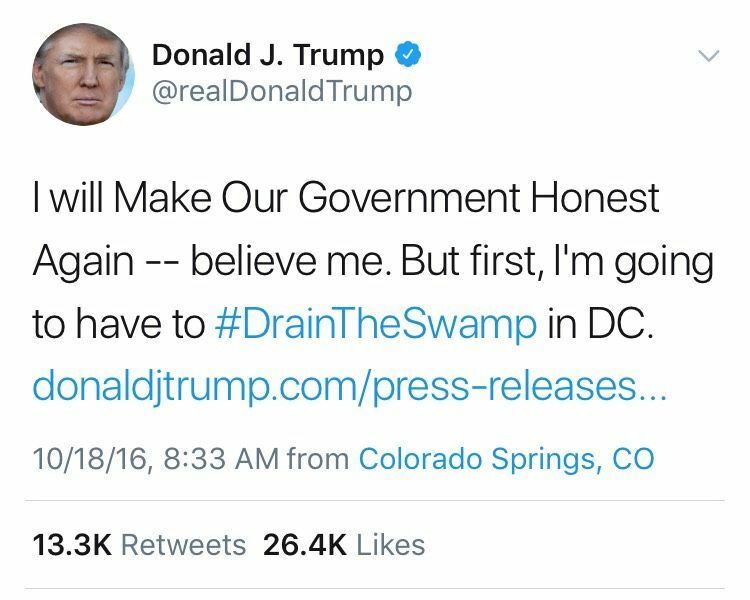 And while many understood that his “rigged system” was just an excuse, “drain the swamp” sure sounded like a promise. 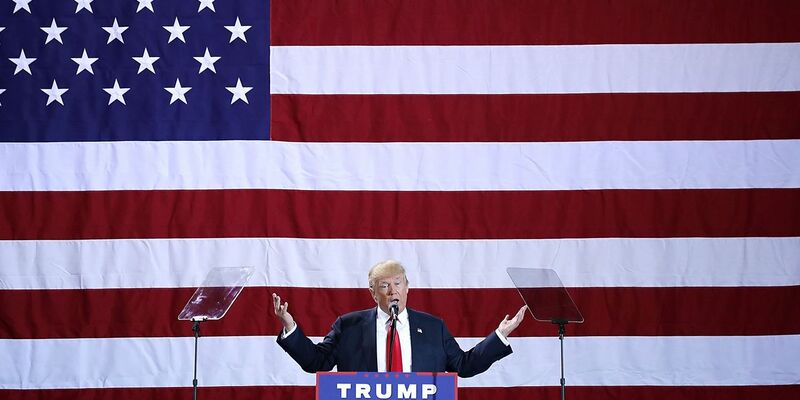 So as the presidential inauguration approached, anticipation bubbled through the sulfurous nexus of Capitol Hill politicians, special interest groups and their K Street lobbyists, the media, the establishment and just about everyone else who had dismissed Trump and his slogans as a publicity stunt. There was now a question, rather urgently in need of an answer: Was he serious about all that “swamp” stuff? Someone from Trump Tower must have placed an angry call, because the former speaker soon tweeted that he’d overstated the case. But that didn’t kill the story. That same day, Politico wondered if “drain the swamp” would be Trump’s “first broken promise.” It cited the access-peddling lobbying firm of Trump’s first campaign manager, Corey R. Lewandowski, as well as the consulting firm with troubling foreign ties run by his incoming national security adviser, Michael T. Flynn. “Trump and his allies have engaged in some of the same practices they accused Hillary Clinton of exploiting and vowed to change,” Politico wrote. Now, a year after the election—and more than a year after Trump first made that pledge to the American people—many observers believe the swamp has grown into a sinkhole that threatens to swallow the entire Trump administration. The number of White House officials currently facing questions, lawsuits or investigation is astonishing: Trump, being sued for violating the “emoluments clause” of the U.S. Constitution by running his Trump International Hotel in Washington, D.C.; Paul J. Manafort, the second Trump campaign manager, indicted on money laundering charges in late October; Flynn, for undisclosed lobbying work done on behalf of the Turkish government; son-in-law and consigliere Jared Kushner, for failing to disclose $1 billion in loans tied to his real-estate company; and at least six Cabinet heads being investigated for or asked about exorbitant travel expenses, security details or business dealings. An allegation of corruption is, of course, not proof that corruption took place, but when has the American body politic ever awaited certitude before passing judgment? “The most corrupt presidency and administration we’ve ever had,” says Zephyr Teachout, a Fordham University law professor who authored a book titled Corruption in America: From Benjamin Franklin’s Snuff Box to Citizens United. Trump friend Christopher Ruddy, the publisher of conservative outlet Newsmax, laughed off the suggestion that Trump would enter public service to enrich himself, as critics have suggested. At the same time, he added, "I don't think it's like they wake up in the morning and say, 'How can we drain the swamp today?'" Ruddy thinks Trump can only do so much to fulfill his promise on ethics. "At the end of the day, the swamp rules," he told me, referencing the enormous class of unelected technocrats that will outlast Trump's presidency, as well as all the ones that come after. But according to the presidential historian Robert Dallek, no American leader has acted with more unadulterated self-interest as Trump. Dallek says that in terms of outright corruption, Trump is worse than both Ulysses S. Grant and Warren G. Harding, presidents who oversaw the most flagrant instances of graft in American political history. Grant’s stellar reputation as a Civil War general is tarnished in part by the Whiskey Ring scandal, in which Treasury Department officials stole taxes from alcohol distillers; members of Harding’s administration plundered oil reserves in Teapot Dome, a rock outcropping in Wyoming that has lent its name to the most notorious example of government corruption in American political history. In both cases, the fault of the president was in his lack of oversight. As far as Dallek is concerned, something more nefarious is at work in the White House of Donald Trump. “What makes this different,” Dallek says, “is that the president can’t seem to speak the truth about a host of things.” Trump isn’t just allowing corruption, in Dallek’s view, but encouraging it. "The fish rots from the head," he reminds. Representative Elijah E. Cummings of Maryland, the ranking Democrat on the House Committee on Oversight and Government Reform, puts the matter even more bluntly: "I've never seen anything like this." 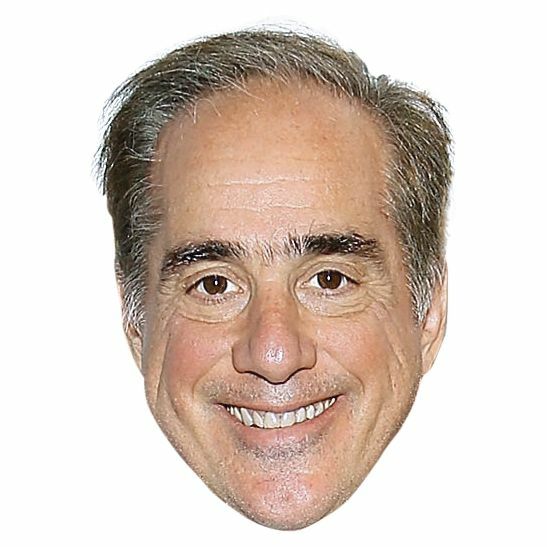 On June 29, Secretary of Veterans Affairs David J. Shulkin sent a memorandum to top managers in his department. In the memo, “Essential Employee Travel,” Shulkin outlined a new process by which travel would be approved and documented. “I expect this will result in decreased employee travel and generate savings,” he wrote. The Post noted that American taxpayers reimbursed Bari for her expenses during the trip, which may have been as high as $3,600 per day. 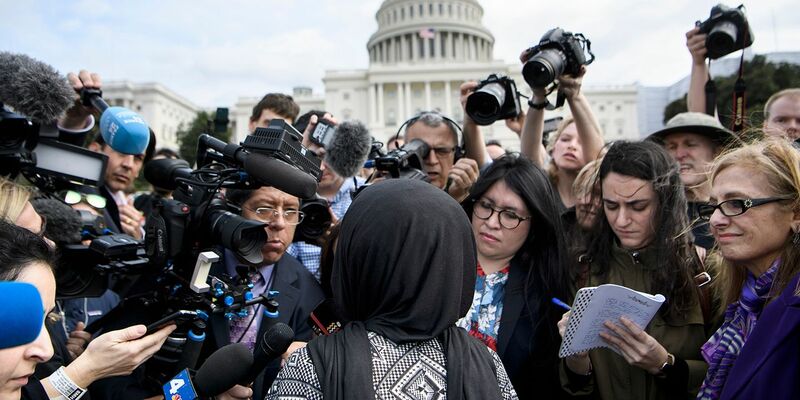 Although some of the other members of the party paid for their travel, taxpayers nevertheless incurred significant costs associated with flights and security. Perhaps it is naïve to expect a Cabinet head to Skype into international gatherings, but the previous VA head, Robert A. McDonald, had not needed to take a single trip abroad to do his work. 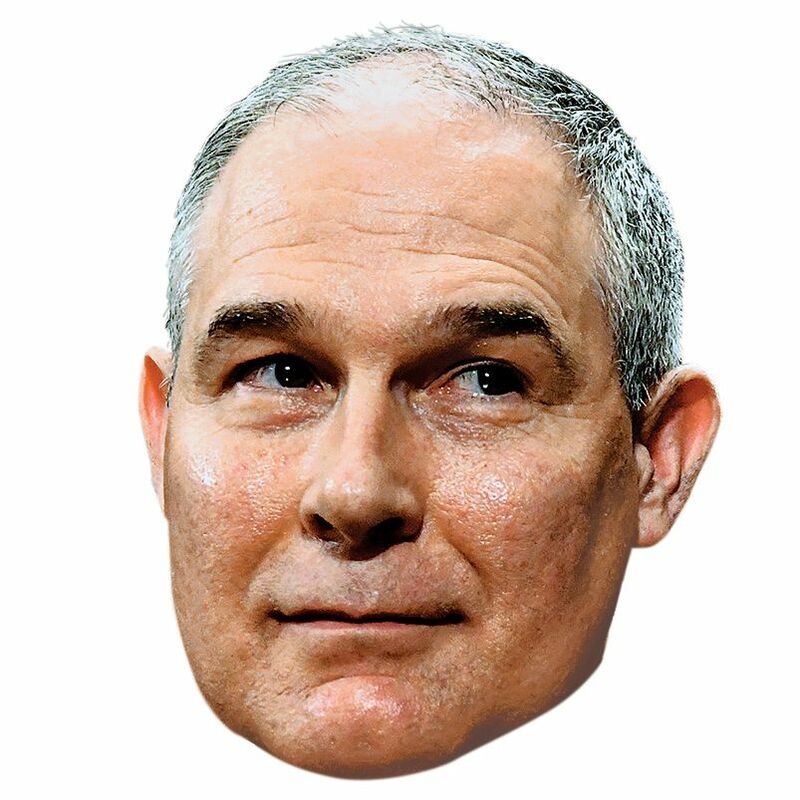 >>>The inspector general of the Environmental Protection Agency is investigating its administrator, Scott Pruitt, for what The Washington Post says are “at least four noncommercial and military flights” in the past eight months, these having cost the government more than $58,000. Pruitt has also built himself a $25,000 soundproof booth in his office, for reasons that remain unclear. Pruitt’s personal security detail includes high-ranking EPA investigators who are supposed to be tracking environmental violations. >>>Steven T. Mnuchin, the former Goldman Sachs banker who now runs the Treasury Department, faced an inquiry from his agency's inspector general for allegedly commandeering a government jet so that he and his wife, Scottish actress Louise Linton, could see the Great American Eclipse in Lexington, Kentucky. That trip came to light after Linton engaged in a social media spat with an Oregon woman who was disgusted by the couple’s displays of wealth. 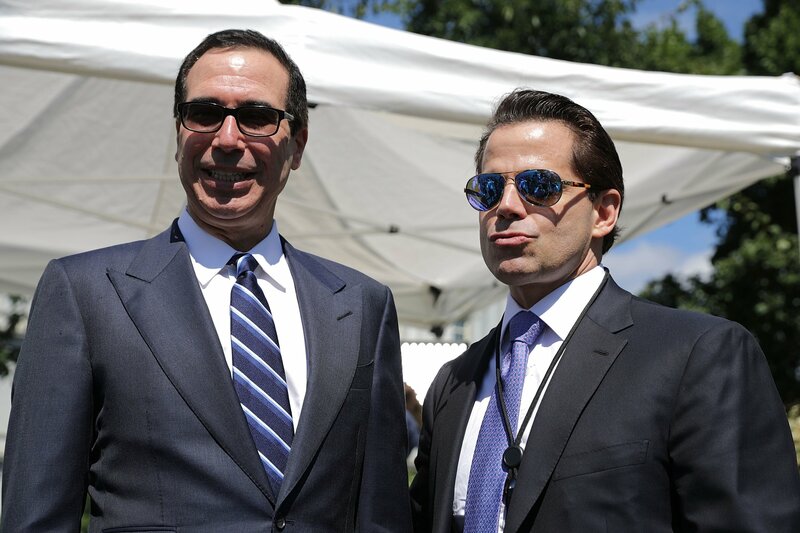 The inspector general eventually concluded that Mnuchin had not travelled to Kentucky solely to see the eclipse, but the episode was embarrassing all the same. That same month, Mnuchin took a U.S. Air Force C-37 jet from New York to Washington. The trip cost taxpayers $25,000, and while use of military planes by government officials is common, there are dozens of commercial flights daily that cover the same route. Timothy F. Geithner, who was President Barack Obama’s secretary of the treasury, frequently flew coach when he made that trip. 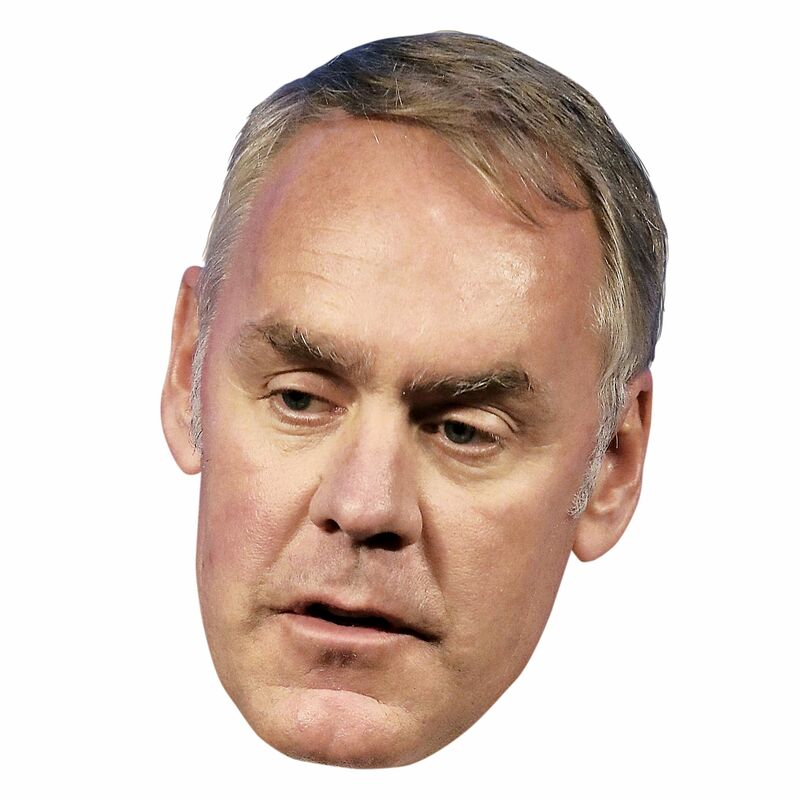 >>>Ryan Zinke, the interior secretary, is being investigated for travel expenses that include a $12,375 chartered flight to Montana from Las Vegas, where he had attended an event for a hockey team owned by one of his benefactors. Zinke is being investigated for two other chartered flights as well. 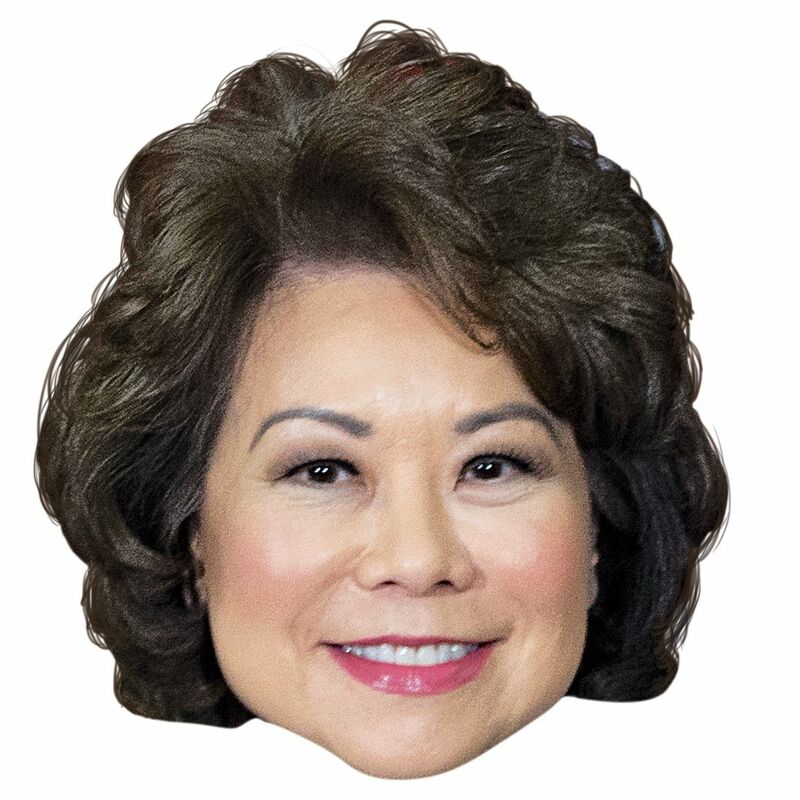 >>>Elaine L. Chao, who heads the Transportation Department, has used government planes on at least seven occasions, according to The Washington Post. She is also facing questions about her ownership of stock in Vulcan Materials, a building company that would likely benefit from a $1 trillion infrastructure plan Trump has touted. >>>Betsy DeVos, the education secretary, pays for her private flights (she is a billionaire), but she uses security from the U.S. Marshals Service, a highly unusual move that will cost the American taxpayer about $1 million per month. 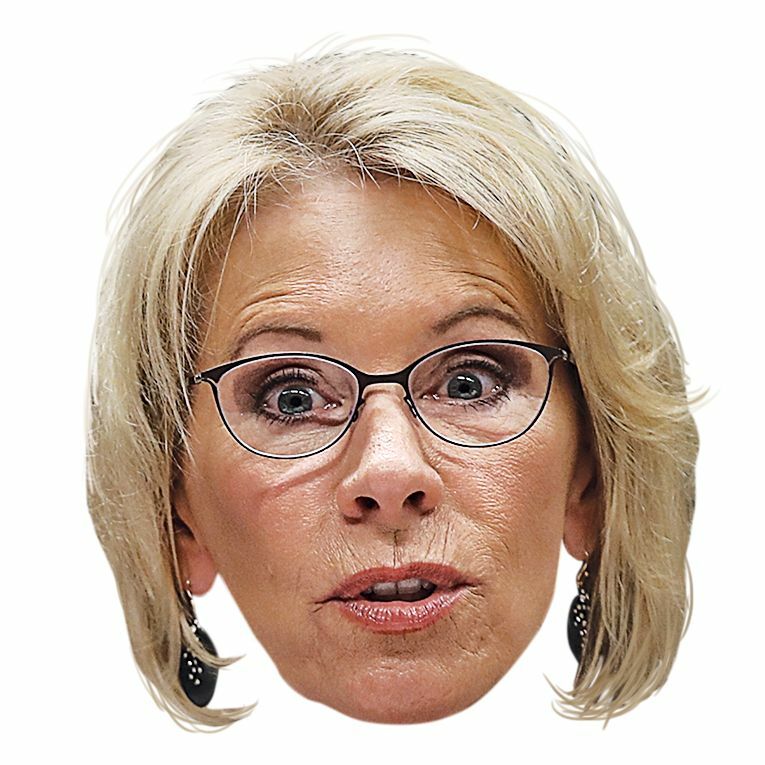 She is the first education secretary to have such extensive protection in recent history. 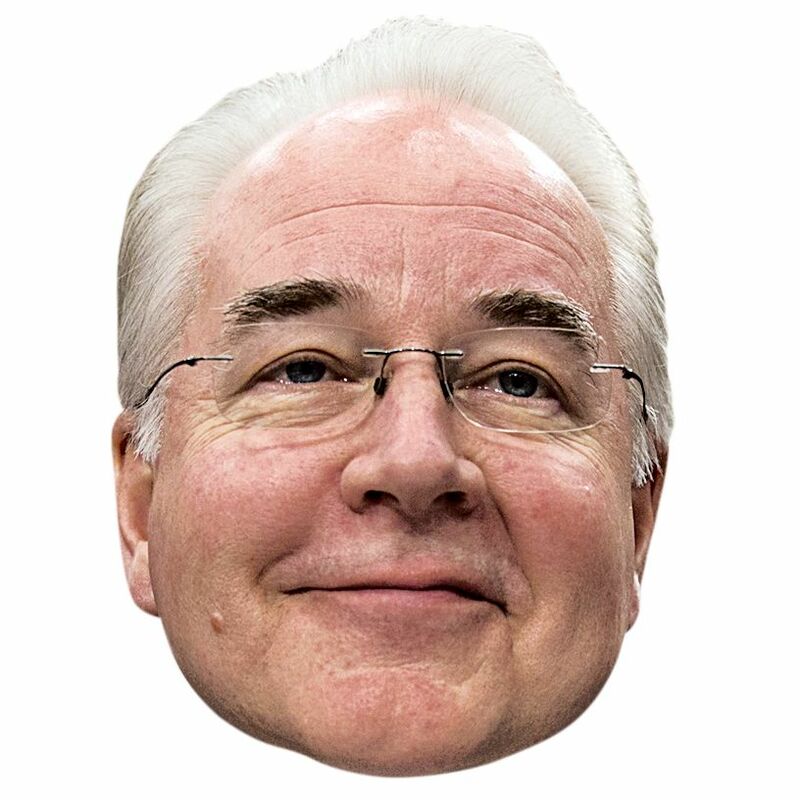 Chiding chatter about the Trump administration’s high-flying ways began when Politico reporters Dan Diamond and Rachana Pradhan got a tip that Health and Human Services Secretary Tom Price was using private planes to jet around the globe, infuriating already-demoralized HHS employees back home with grating dispatches from Switzerland, Liberia and elsewhere. 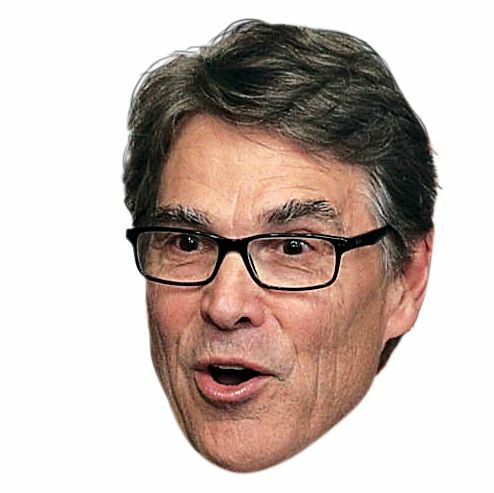 As Diamond and Pradhan wrote, the “notoriously secretive Cabinet secretary” had not been forthcoming about his travel records, in keeping with the Trump administration’s broader aversion to releasing records unless forced to. Their shoe-leather reporting included waiting at the charter terminal at Dulles International Airport in Virginia, hoping to see Price entering or leaving a private jet. Diamond and Pradhan published their initial story on Price’s private-jet travel on September 19, their details dredged from the very swamp Trump promised to drain: costly chartered flights to Philadelphia, when Amtrak would have sufficed, as well as a trip to the Aspen Ideas Festival, a potent symbol of the elitism Trump had denounced during the campaign. 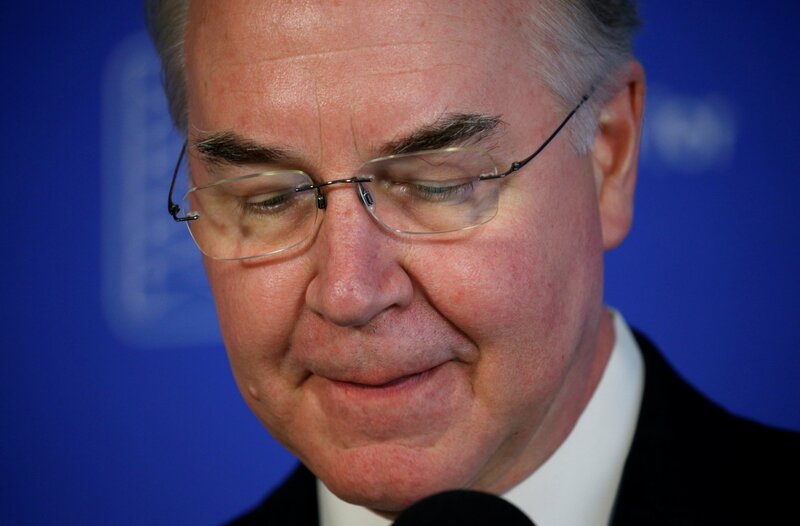 Trump was furious, and Price resigned at the end of the month, after offering to pay back $52,000 of his travel costs. 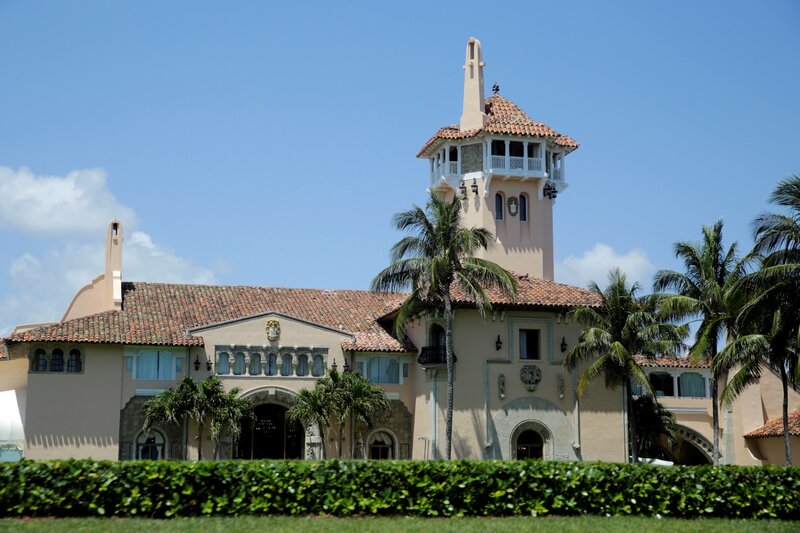 The total cost of his taxpayer-funded jaunts is estimated to be $1 million. This behavior is outrageous—but also puzzling, since Trump’s Cabinet has been estimated to be worth at least $4 billion, making this White House the wealthiest in American history. These were people, we’d been told, who were sacrificing lucrative private-sector posts to work in the service of the American people. 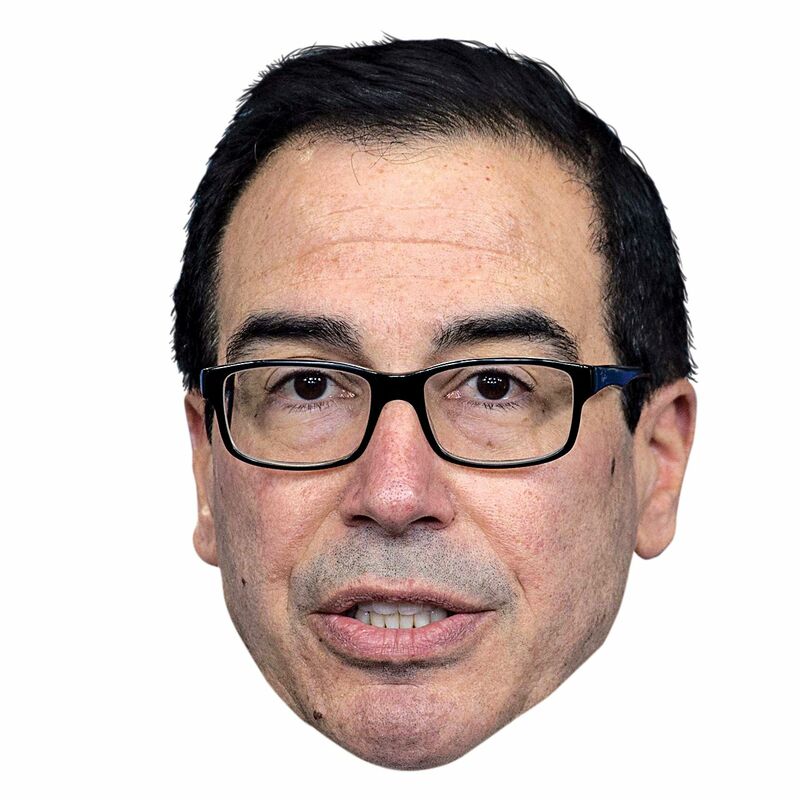 Now, those very same “forgotten Americans” were paying for Mnuchin, worth as much as $500 million, because he apparently didn’t want to go through airport security. In his Cabinet are many people who went to Ivy League universities, worked for Fortune 500 corporations. They had to know better. And if they didn’t, how can we trust them? But Apol’s dismay, however welcome, is not enough for all those who believe the Trump administration is unwilling to face up to its ethical shortcomings. “You don’t see any shame here,” says E.J. Dionne Jr., the Washington Post columnist and co-author of the new book One Nation After Trump. 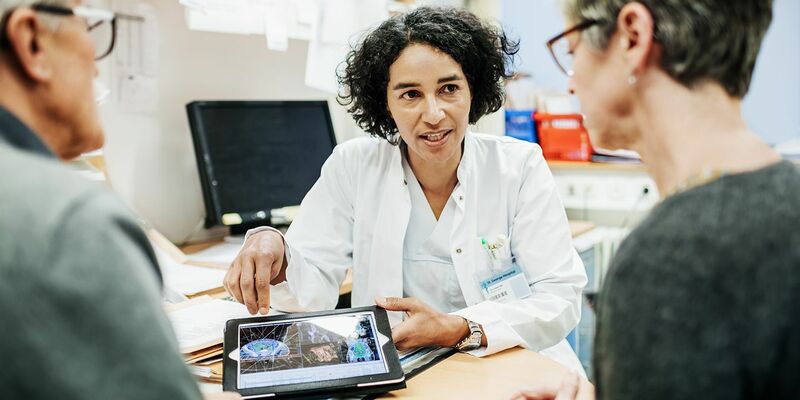 On the morning of November 9, Teachout was dealing with a personal political loss: The night before, she had lost to Republican John J. Faso for a House of Representatives seat in the Hudson River Valley, north of New York City. Teachout had run an anti-corruption campaign, while Faso was a fairly conventional Northeastern Republican who never resolved his apparent unease about Trump. Voters apparently did not mind. Sometime that day, she spoke to a Clinton critic who may have voted for Trump (he only revealed that he hadn't voted for Clinton). “I just want to put a stick in the stream,” he told her. The vote a small act of defiance, since New York State was safely Democratic. But even a small vote can be telling. 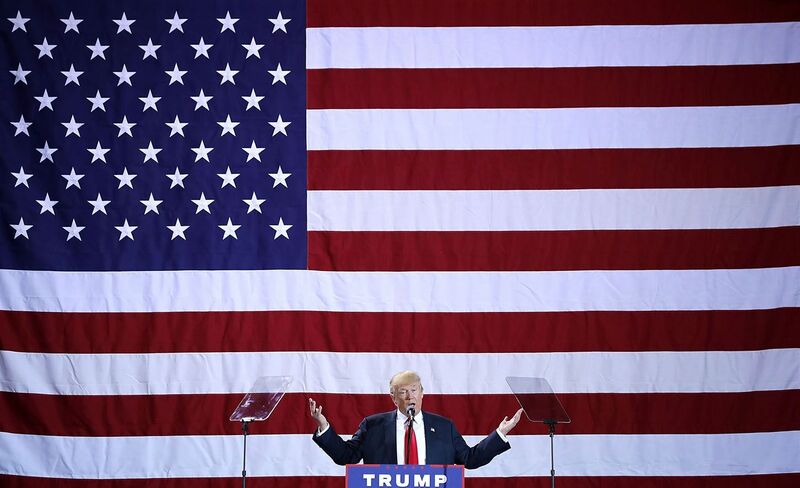 By possibly casting a ballot for Trump, the man indicated his profound exasperation with the political system, as well as his conviction that only a wholesale reimagination of what government did—and how—could make Americans believe in government again. Even if it wasn’t clear what Trump meant by “drain the swamp,” the image powerfully evoked a righteous cleansing, a renewal of the tired, infertile land. “The language of corruption is incredibly powerful,” Teachout says, and Trump’s campaign harnessed that power to great effect. But the transition to governing presented new challenges, foremost among them questions about the inscrutable, transnational Trump Organization, which has included everything from a line of steaks to a new hotel in the heart of D.C., in a building leased from the very federal apparatus he now controls. On January 11, just days before the presidential inauguration, Trump held a press conference at Trump Tower in midtown Manhattan to address ethics issues surrounding his administration. “I could actually run my business and run the government at the same time,” he boasted. His tax lawyer, Sheri A. Dillon, described a vague arrangement in which Trump would not manage his businesses, but also not disassociate from them. On a table next to Trump were stacks of papers, presumably relating to his finances. A reporter’s photograph suggested the papers were blank, just for show. “The tone was set by the president when he decided not to divest,” says Walter M. Shaub Jr., who’d been appointed by Trump’s predecessor, Obama, as the head of OGE, and who remained in that post during the transition and first five and a half months of Trump’s tenure. 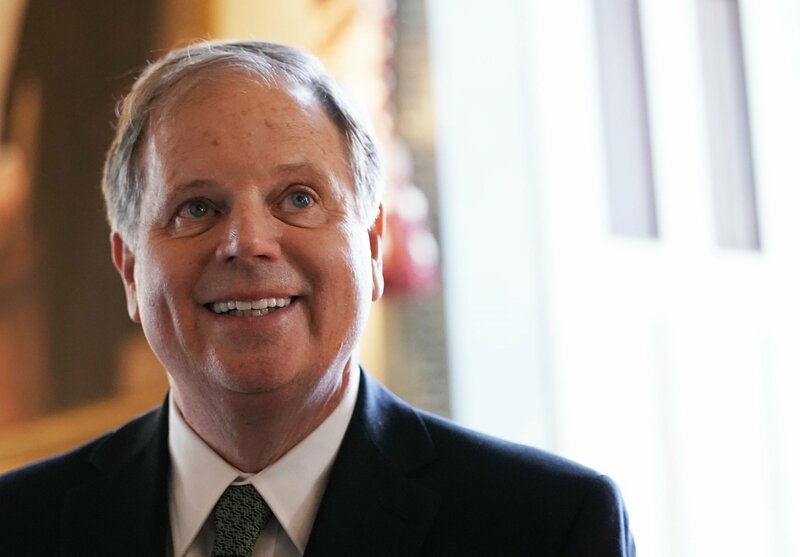 He says this administration “came in unprepared for the rigors” of working within the federal government, “unaware of the fact that there are many requirements and a culture of accountability to the public." Shaub blames a lot of the ethical lapses on White House counsel Donald McGahn II, whom he charges with fostering an anything-goes atmosphere by interpreting rules and laws in ways that allowed Trump to skirt them. “He has been the great enabler. 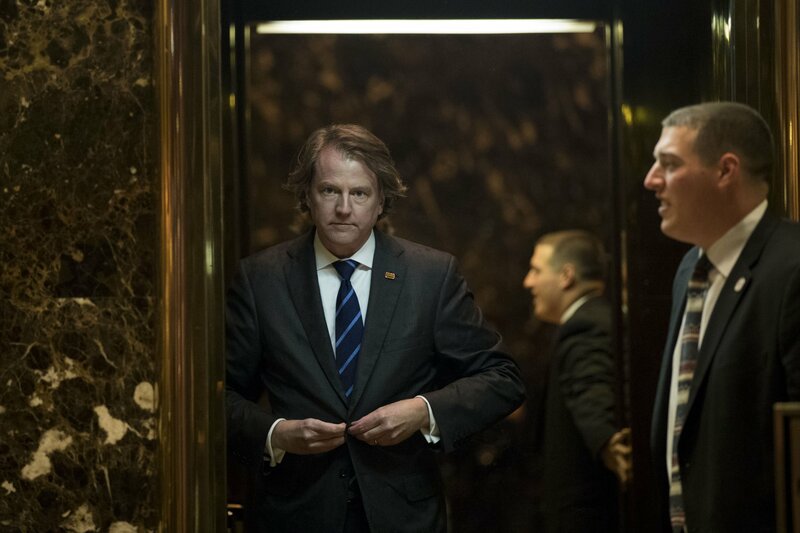 And he has been an amplifier of the message that ethics doesn’t matter.” McGahn did not respond to a Newsweek request for comment. A senior White House official who was only authorized to speak on background disputed the assertion that the Trump administration has not made ethics a priority. He says the lawyers working on ethics issues in the White House are “not shrinking violets” and points to the elevation of their office to deputy status, presumably giving those lawyers greater sway. 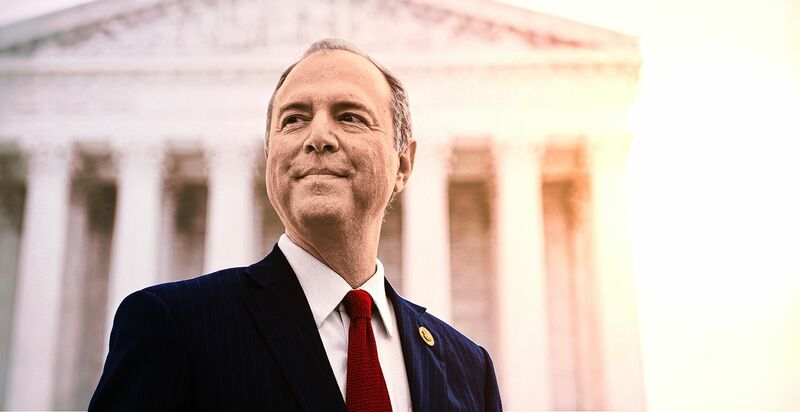 The office is headed by Stefan C. Passantino, deputy assistant to the president and deputy counsel to the president, who, upon his appointment, was praised by Howard Dean, a former Democratic primary candidate for the presidency and governor of Vermont. 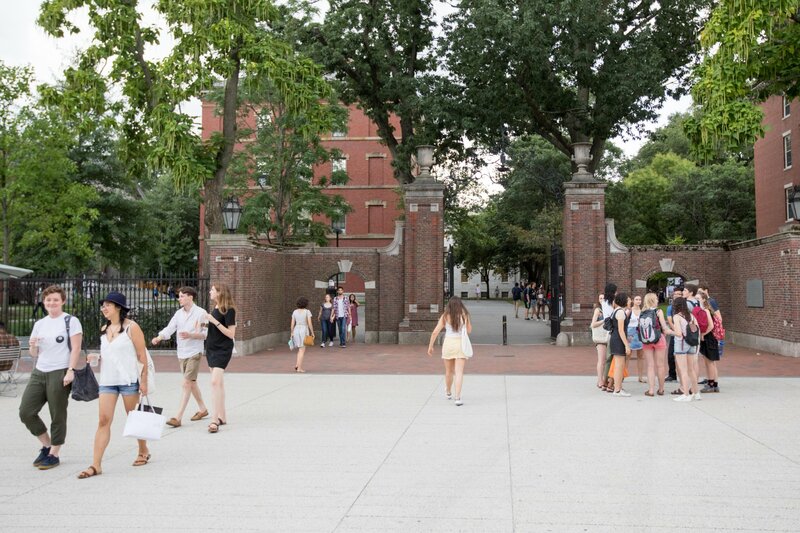 “I have a lot of confidence that he will be clear about what the ethical and legal boundaries are in his advice to the White House,” Dean said at the time. One individual who worked with Passantino in the early days of the Trump administration described him as courteous and eager about toiling in the federal government’s employ, a welcome contrast to the surly attitudes of some other high-ranking Trump officials. At the same time, this individual says Passantino was diligently figuring out how to dismantle regulations. He notes that among Passantino’s previous legal clients is Gingrich, who was sanctioned by the House of Representatives over ethical violations. This seemed a flagrant violation of ethics rules, which prohibit elected officials from endorsing a commercial enterprise. 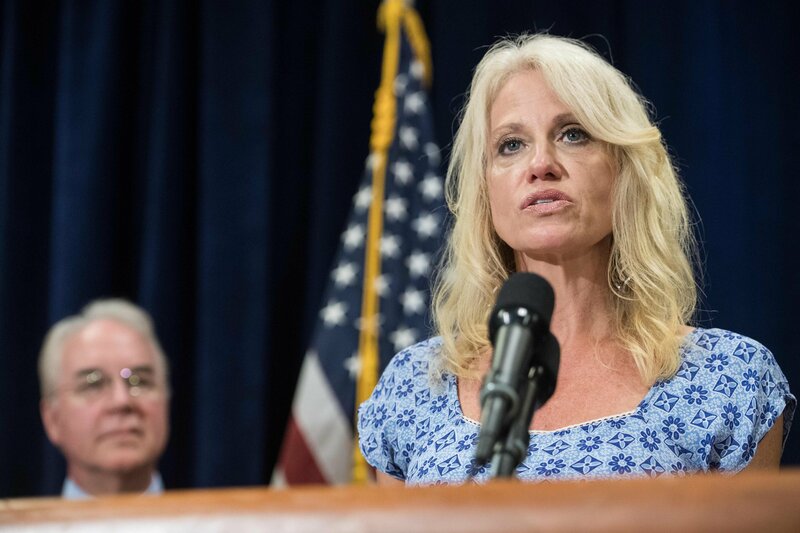 Shaub sent a letter to Passantino, informing him that “there is strong reason to believe that Ms. Conway has violated the Standards of Conduct and that disciplinary action is warranted.” Passantino wrote back that Conway “made the statement in question in a light, off-hand manner while attempting to stand up for a person she believed had been unfairly treated and did so without nefarious motive or intent to benefit personally." In a footnote, Passantino interpreted federal rules to conclude that Shaub’s office, OGE, did not have oversight over the executive office of the president, meaning that he could not sanction Conway over the endorsement. Shaub was stunned. “The assertion is incorrect, and the letter cites no legal basis for it,” he wrote Passantino. To him, this was evidence that the Trump administration sought not only to disregard ethics rules, but to actively dismantle them. He quit OGE on July 6 and deemed the administration he was leaving behind “pretty close to a laughingstock.” He has been making similarly withering critiques on social media and CNN, which he joined as a contributor in September. Shaub’s migration to cable news has annoyed supporters of President Trump. Another CNN regular is Richard W. Painter, who was the chief ethics lawyer for George W. Bush and is vice chair of the group, Citizens for Responsibility and Ethics in Washington, suing Trump over the emoluments clause. Another CREW member, its chair and sometime CNN commentator, is Norman L. Eisen, who occupied the same position in the White House of President Obama. The White House senior official I spoke to expressed dismay at this “machinery” of outrage, calibrated perfectly to a liberal viewing audience. When I raised these concerns to Shaub, he laughed them off as “deeply cynical.” He knew that the White House thought of him. He wasn’t bothered by it. The most significant action by Trump to drain the swamp was taken a week into his presidency. 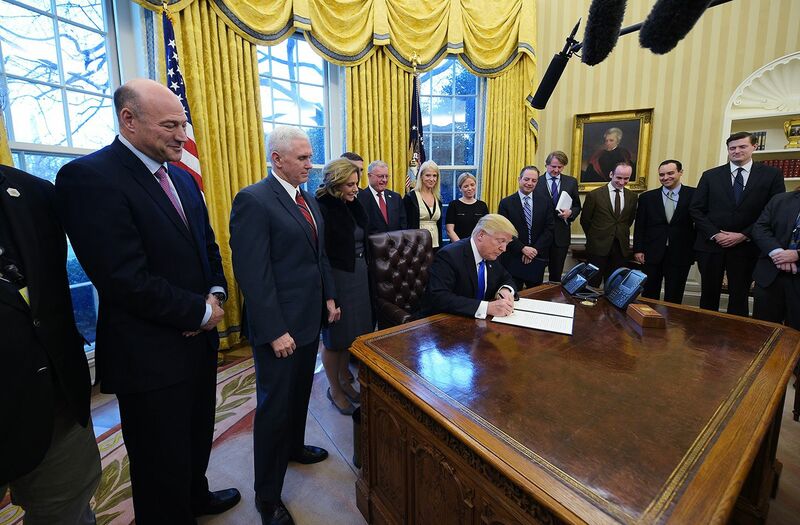 On January 28, he signed Executive Order 13770, titled “Ethics Commitments by Executive Branch Appointees.” All such appointees had to pledge that they would not lobby the agency to which they were appointed for five years after leaving it; they would abide by restrictions regarding contact with agency officials; would not lobby foreign governments after working for the administration; would not accept gifts from lobbyists; and would follow other regulations. Shah calls it “the most sweeping Executive Order in U.S. history to end the revolving door” between 1600 Pennsylvania Avenue and the lobbying firms of K Street, singling out the injunction against foreign lobbying in particular. In some ways, the order is not dissimilar from what was in place during the Obama administration. But Eisen thinks the widespread granting of ethics waivers by the administration—that is, permits to violate the new rules—completely undermine the executive order. “They’ve made a mockery of the executive order and of ethics in general,” he cried out when I called him, claiming that the Trump administration has “virtually no standard” on how such waivers are granted. Fourteen such waivers had been granted as of May 31. While Trump officials have described the executive order as being not much different from the one that guided the Obama administration, Eisen finds that assertion preposterous: “It’s an ethics calamity of a kind we have never seen in modern presidential history.” In June, a liberal super PAC called American Bridge 21st Century found 74 lobbyists working in the administration, 49 of them in agencies they once lobbied on behalf of clients. The new deputy administrator of the EPA, for example, is former coal lobbyist Andrew R. Wheeler. “This will not take away one vote,” says Sam Nunberg, a longtime Trump associate who was fired from the presidential campaign in 2015. Cummings, the Democrat from Maryland, has begun to investigate the travel habits of Trump administration cabinet members. Yet he believes that Republicans will ultimately protect the president himself. "They've come to basically accept his conduct," Cummings told me. "The things he is doing, he could not do without the Republicans in Congress aiding and abetting." It is not clear what they will get in return. If Painter is right, it won't be much. As for the “drain the swamp” plan, with its vision of purified Washington? I managed to find the link to the original press release and, feeding it into my browser, was transported to those late October days when pundits mused about whether Clinton would take Arizona and whether Trump would start a television network of his own. The link loaded, but the page was empty. This article has been updated to more accurately reflect the status of the inquiry into Treasury Secretary Steven Mnuchin's travel.